The most common way that people get bed bugs is by bringing them home from somewhere else. That’s why it’s natural for bed bugs to incite panic on first sight. When you spot a bed bug, you have no way of knowing how many countless more might be hiding nearby. How can you tell if the bed bug is a lone traveler or a sign of an infestation? Bed bugs are masters of both hitchhiking and hiding. It’s hard to say for sure whether the bed bug you found is all alone or not. Yet that’s an important question to answer because it determines your next steps. Should you be working on prevention or eradication? It may seem like an obvious thing: you found a reddish/brownish crawling bug that looks like the bed bugs you’ve seen online or on TV. Yet many supposed bed bug sightings are actually false alarms. Since different pests spread differently, and are treated differently, it’s important to be sure of exactly what you’re dealing with. Bed bugs have a distinct body shape, shell pattern, and color. They are especially distinguished as an adult, which is when you’re most likely to see them crawling around in the open. Unlike beetles and most other indoor pests, bed bugs have mostly flat bodies rather than rounded or bulbous abdomens. They have a reddish-brown hue and thick bands that make their shell appear vaguely striped. Most importantly, their abdomen ends in a point, similar to the narrow tip of an apple seed. If you found a dark round bug crawling on your bed or elsewhere in your home, don’t immediately jump to the conclusion that it’s a bed bug. The pest might actually be one of many common indoor pests, such as carpet beetles, cigarette beetles, or flour beetles. If it’s smaller than a bed bug, it might actually be a mite or a tick. If the legs are much larger than a bed bug’s, it’s more likely a roach or a spider. Bed bugs are expert travelers. They can hitchhike from place to place by hiding on coats, backpacks, luggage, and more. This is the main way that infestations spread: a pregnant bed bug hitches a ride from one home to another through a public setting. This often occurs on planes, trains, buses, waiting rooms, and other public places with a lot of foot traffic. With that in mind, it’s important to understand why you might spot a bed bug in public, and why that’s not necessarily reason for panic. When seen in public, bed bugs are most likely in the process of traveling between infestations. Bed bugs feed on sleeping humans, and as such need a consistent sleeping host nearby in order to thrive in one place. Since bed bugs won’t have a reliable food source in public, nests there are unlikely. Seeing a bed bug near where you sleep is a bigger concern. Whether it’s a juvenile or an adult, appearing well-fed or not, you can’t be sure if the bug has recently fed on someone in your home. To make matters worse, the number of bed bugs you see out in the open offers no indication of how many bugs are actually in the area. For every bug you see out and about, there could be dozens more hiding out of sight. Once you’ve identified at least one bed bug in your home, you’ll probably wonder if it came alone recently or was born there as part of a nest. Bed bugs feed and reproduce every 5-10 days. This means that the “window” from lone traveler to early infestation is only that narrow. 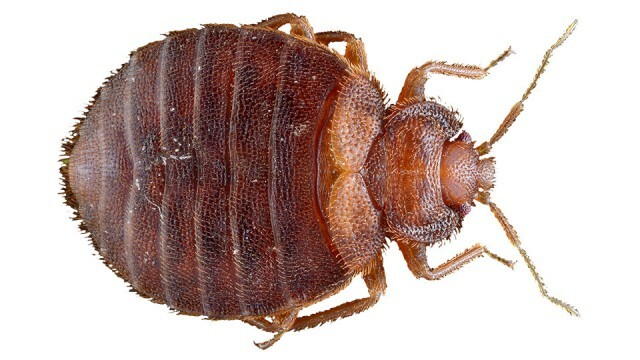 If you’ve been on the go in the last 5-10 days, such as on a business trip or holiday, there’s a chance that this is the only bed bug in the home. If not, you’re most likely dealing with an established infestation. Start by stripping the bed of its sheets, covers, and pillows. Then thoroughly inspect the mattress, box spring, headboard, footboard, frame, sheets, covers, pillows, and anything else that was on the bed. Once you’ve checked out all of the seams and folds of the bed, move on to nearby furniture, then the other cracks and crevices throughout the room. Make sure to search slowly and carefully so that you don’t miss any signs of bed bugs. Use a flashlight and a stiff card (like a bank card) to help scrape stuff out of tight spaces. Remember that bed bugs have flat bodies and they can fit in tight spaces – pretty much anywhere a credit card can fit. Of course, no visual inspection is 100% reliable. Even if you don’t find any other signs of bed bug activity in the room, you should play it safe with some basic prevention steps. The main method of preventing infestations is to isolate the bed to make sure bed bugs can’t reach its occupants while they’re asleep. Move the bed away from the walls and any nightstands or other furniture. Tuck in or remove any hanging skirts or sheets, and remove any storage under the bed that is touching any part of the frame. The only thing your bed should be touching is the floor via its legs. If you don’t have a bed frame with legs, you should purchase one to sleep in, at least until you are bed bug free. To complete the isolation, wrap the mattress and box spring in bed bug proof encasementsand place ClimbUp Interceptors under each leg of the bed. The encasements ensure that no bed bugs that evaded your search can escape or feed, and they make future inspections much easier by providing a single smooth surface. The traps will prevent bed bugs from climbing up your bed legs, stopping them from reaching you in your bed. As bed bugs attempt to get to you, they will climb up the edge of the interceptor and fall into the perimeter pitfall where they can’t escape. With the ClimbUps in place, you can monitor the population of bed bugs in the room over the next several weeks (and even longer to avoid future infestations).